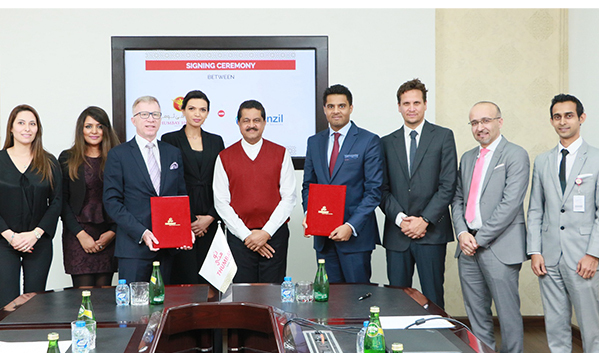 Ajman, United Arab Emirates, February 24th, 2019: As part of its efforts to further extend superior home health services in the Northern Emirates, Manzil Healthcare Services, the leading Home Health and Disease Management Company in UAE, has announced today its collaboration with Thumbay Hospital Group. Manzil Healthcare Services is committed to offer a host of home health services for Thumbay Hospital patients, which include Post-Hospital Discharge care, Paediatric Care & Senior Care, Physiotherapy, Mother & Baby Services, Wound Care, Ventilated Care and other specialized home health services. The collaboration is also expected to add strength to the clinical expertise of Manzil Healthcare Services giving them access to Thumbay Hospital Group’s team of medical experts and doctors across specialties, who will be extending their care and consultations to Manzil.